Austrian aurist; born at Alberti-Irsa, Hungary, Oct. 1, 1835; studied medicine at the University of Vienna, receiving his diploma in 1859 and becoming assistant at the university hospital. 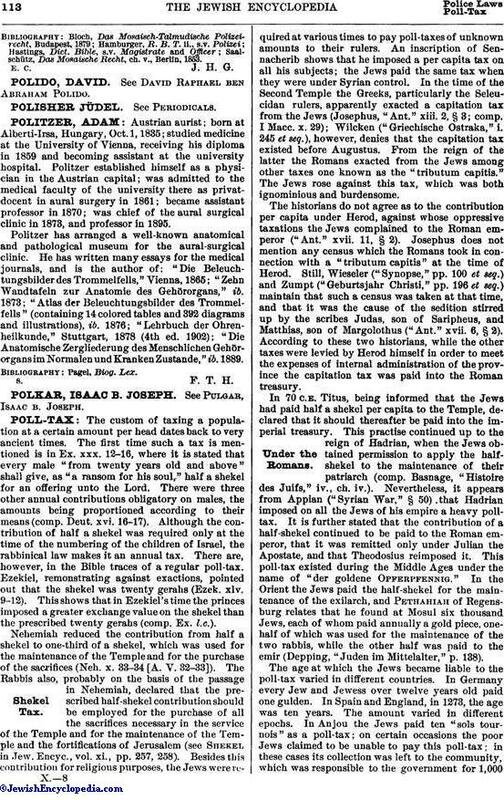 Politzer established himself as a physician in the Austrian capital; was admitted to the medical faculty of the university there as privatdocent in aural surgery in 1861; became assistant professor in 1870; was chief of the aural surgical clinic in 1873, and professor in 1895. Politzer has arranged a well-known anatomical and pathological museum for the aural-surgical clinic. He has written many essays for the medical journals, and is the author of: "Die Beleuchtungsbilder des Trommelfells," Vienna, 1865; "Zehn Wandtafeln zur Anatomie des Gehörorgans," ib. 1873; "Atlas der Beleuchtungsbilder des Trommelfells" (containing 14 colored tables and 392 diagrams and illustrations), ib. 1876; "Lehrbuch der Ohrenheilkunde," Stuttgart, 1878 (4th ed. 1902); "Die Anatomische Zergliederung des Menschlichen Gehörorgansim Normalen und Kranken Zustande," ib. 1889.